In the Wiki, click Lists. Wiki Lists are a way to store non-clinical data in a convenient table format. For example they can be used to store contact information or network devices. Wiki lists are stored as tables in the database, so they are both searchable and reportable. 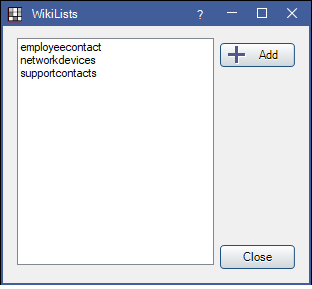 Example of a wiki list used for storing contact information. User's must have the Wiki List Setup security permission to add or delete columns, or to delete rows. In the Main Menu, click Tools, Wiki. Then click Lists in the top toolbar. Double click on a list to open, or click Add to create a new list. When you first create a list, there will be a static column on the left named "tablename" Num. This is the primary key column and cannot be moved or renamed. It can only change in width; any changes to heading will be ignored. 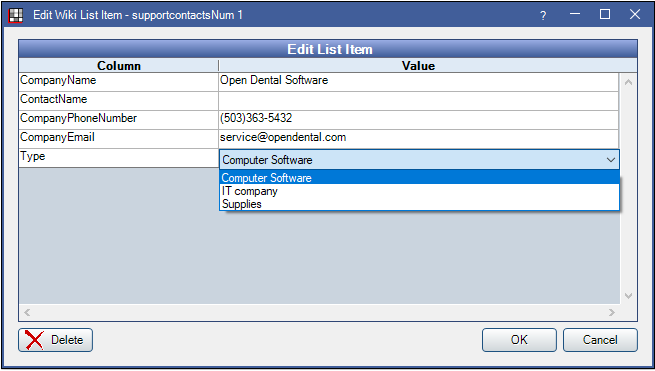 If additional columns are added, the items in the list will be sorted alphabetically by the second column contents. Click on a value to enter text, or select from a dropdown menu. A new column will appear on the right. The default name is Column1. Click Edit to make changes to the column header, width, or pick list options. Double click in a Column Name cell to rename. Double click in a Width cell to change column size. Click Add to add pick list options. To remove an option, highlight it then click Remove. Move or remove columns from the main Edit Wiki List window. 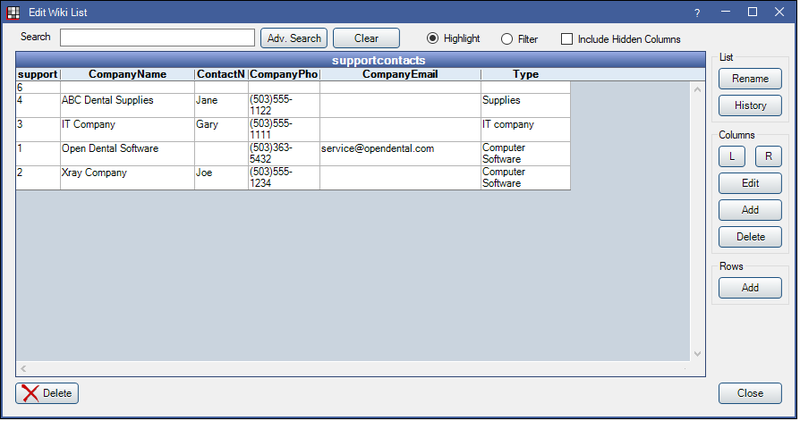 Highligh a column, then click Delete under Columns to delete it. Click Rename in the upper right. Enter the name of the list and click OK. This name will be the identifiable name in the database, and will include no spaces or capital letters. There are several ways to customize the wiki list search. Enter the criteria in the Search field. If Highlight is selected, matching entries will highlight yellow and the list will automatically scroll to the first match. If Filter is selected, only the matching entries will display as unmatching entries are filtered out. Click Adv. Search at the top to launch the Advanced Search window. Select a column or columns to limit the search to only those columns. Click OK. Search will change to Advanced Search in the Edit Wiki List window. Click Clear to return to the normal search. Each wiki list represents a table in the database named using the follow format: wikilist_listname. You can generate a query from a wiki list using User Query. Example: "SELECT * FROM wikilist_employeename"